What's The Worst Beater You've Ever Had? Y'know, I have a hard time thinking of Raphael's car as a hunk of crap. Yeah, it's old, smelly and breaks in amusing ways, but it's at least an awesome aircooled Volkswagen. Those are easy to fix! That's not even fair. I had a deceptively shiny car that sucked at being a car. Get off my lawn. Back in my day, we didn't have fancy machinery like Miatas, 12Cs, Baja Beetles or RS4 Avants. (Wait, we still don't get that last one...CURSES!) 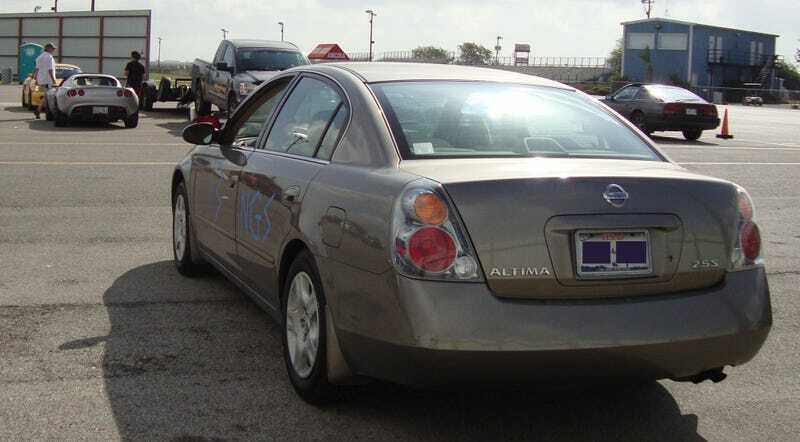 I had a smelly Nissan Altima that never ran very well, and I hooned it, uphill, both ways and even in the snow a couple times. Never mind that "my day" was four years ago or that we don't get snow that often. This is the car that left me stranded for weeks at a time without a car. It liked to eat its own head gasket, which caused the car to shut off its air conditioning to keep from overheating. In August. In Texas. During one of the hottest summers on record. Head gaskets and my sanity weren't the only things it ate. It ate oil. It ate gas. It had an exhaust leak that ate an absurdly pricey O2 sensor. People liked to pull off its hubcaps in Waco, which sucked even more because they were bolted to the center of the wheel. I'd come out to my car to find one wheel with broken shards of plastic affixed to the middle. If you ever need to find a hubcap in Waco, I know all the places to look. I had it at Baylor, where the parking situation often makes you wish you had an Isetta. That is, if you can find parking. This car was simply too big. Even the cup holders were a ludicrous size. If I ordered anything smaller than a venti at Starbucks, the caverns between the two front seats would devour the cup whole and it would be hard to reach. Worst of all, the automatic transmission often didn't want to work unless you floored it. It was like playing throttle roulette—will this pedal work today, or has the car forgotten its daily dose of Sarafem? To say "I hated it" would be an insult to the warm and cuddly feeling that is pure, unadulterated hatred. This shiny polished turd earned a nickname: "The Failtima." It's also proof that you likely do, in fact, have the correct car to start doing trackrat things with your friends. After a series of Orlovian excursions into various objects, ditches and other peoples' cars—the likes of which landed me in the Failtima after my first car was totaled—I came to the conclusion that I probably needed to learn how to drive. Not just pass the state test, which I did on the first try in Washington after knocking over the parallel parking pylon—but actually drive. I did what any rational being with a car they'd like to set on fire would do: I started doing some autocross. Spokes ran their autocrosses close enough in Texan terms (read: "only a couple hours away") that I figured eh, why not? Let's be honest—I'd have loved to track it, too, but there's no way on earth that this thing would have ever passed its state inspection again without some clever engine bay polishing and frantic clearing of OBD-II codes, much less a pre-HPDE inspection. So, I stuck to less strict pursuits. Autocross was perfect for this car: I was new, it was too slow to get me in much trouble and it wafted from cone to cone in such a floppy, hilarious manner that it often caused passengers to break out in pirate shanties and/or popular T-Pain melodies. I'd found a venue to both release months of pent-up rage at the very object I'd like to toss to the crusher in the most violent manner possible as well as learn a few things in the process. It was perfect. Most of the track day instructors I've met since then claim that they're not annoyed when they get the new guy who shows up in a hand-me-down Corolla. It's the guy who shows up in a fully-built racecar that scares them a little. Concepts like weight transfer are a lot easier to to teach when the car pitches and dives at every braking zone, turn or acceleration point like a big, goofy land yacht. You, there—in the total beater on stock suspension? You're doing this right. The Failtima was never a competitive car, but it was in this miserable, unreliable heap that I got an appreciation for how cars are meant to be driven. No matter what your car is, it deserves to be hooned—for your own good. Mercilessly, in some cases. I'd have traded the Failtima for a Beetle in a heartbeat. So, show us—what's the worst beater you've ever had?